Everyone's got trash, but how they decide to hide it varies. Here, five waste bins that will have you storing your garbage in style. 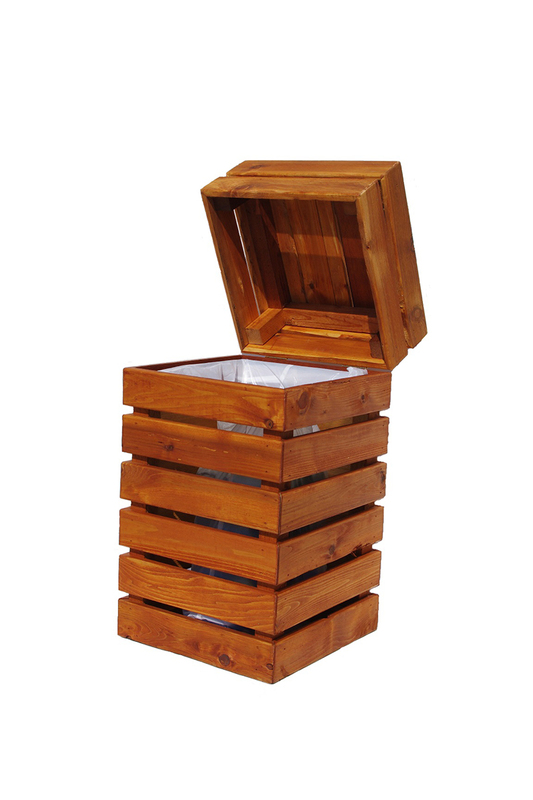 This beautiful handcrafted trash can is made from 100% Western red cedar and the square paneling can "add charm to small spaces and break up large sprawling areas." This geometric waste bin, designed by Grace Youngeun Lee, opens up in an incredibly clever way and honors clean lines and minimalism, despite the mess that may sit inside it. The Pop-up Party Bins from Hobnob USA direct guests to the right bin with their bold graphics. They are made out of cardboard and 100% recyclable, making them perfect for any summer barbecue or work party. Available in black and white, Vipp's classic cylindrical pedal bin with a stainless steel lid and rubber ring around the top that "guarantees air-tight closure". These durable touch bins by Brabantia come in six bright hues (seen here in Apple Green), so they can add a splash of color to any room. If you're looking for a more subtle option, the bin also comes in a fingerprint-proof matte black, so you won't have to wipe it down each time a sticky handprint makes contact.